Observe the cat. They rarely seem ruffled, they are comfortable in their own skin. Cats aren't concerned about what others think of them, they know their own worth. Cats know how to create the most comfortable sleeping spot, sometimes out of the most unlikely choices. A cat will be around you when it wants to be, and politely remove itself when it doesn't. Cats know who they are and what they need. Wouldn't life be simpler if we were able to take these qualities of cats and apply them to our daily lives? Cat Sense, A Feline Style for Living by Karen Farrell is "an adventure in rediscovering yourself" through the characteristics of cats. It is a book of affirmations whose goal is to show us "how to navigate in the world with style and grace." Feline-style. If you love cats and can relate to them better than people, you have probably asked yourself: "Why can't people be more like cats?" According to Karen (and I agree) "the truth is that we can indeed be more like our feline friends." You can choose to read this book in one sitting, flip open the book and select a passage that intrigues you, or choose to read one passage each day that corresponds to an area of your life/personality that you would like to improve upon, "feline-style"
Each feline "tip" has a charming pencil sketch accompanying it. Nothing flashy, just a basic, common-sense sketch accompanying basic, common sense "cat-vice" that we might need to be reminded of in order to help us in our quest for living a better, more authentic life. Be full of whimsy- "the capricious nature of cats is one of the traits that fascinates and charms. Their silliness and high jinx are endearing qualities. Watching them allows us to vicariously enter their childlike kingdom. Their playfulness invites us in and gives us license to be fanciful too. You can adopt this whimsical nature by being madcap, game for amusement, and able to revel in the ridiculous, the impractical and yet, paradoxically, the sublime." Enjoy the nightlife- "cats get their best work done after dark. Certainly kitty cats do not sally forth in the blazing light and heat of the day if they can help it. "Burning the midnight oil" inside, when all is quiet, may help you to get more accomplished." Carve out some privacy- "Cats keep a low profile when they want a break. They find all sorts of ways to escape. Cats know that they can relax more when they are unobserved, out of ones' mind and one's sight. They acknowledge what busy humans sometimes ignore. While public space is a necessary element in any society, private space is a bastion from that same society. Remember that you need a bit of seclusion to refresh the spirit!" My personal favorite is: Be a rebel with your own cause- "Unabashedly looking out for its own aims is the cause of the cat. A cat knows what it wants and is adroit at getting it. While others may waver, hold steady to your convictions. Give yourself permission to be a rebel with your own cause- a cause detailing your most passionate dreams." 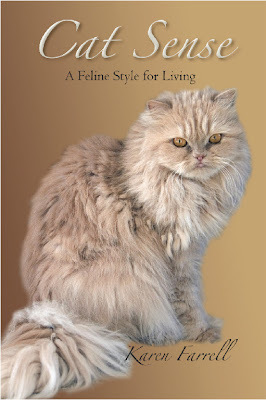 Cat Sense: A Feline Style for Living will deeply satisfy your inner philosopher as it did mine. Communicate succinctly "One simple meow really gets to the point. Remembering to be brief in your remarks makes you more effective. As well, brevity provides welcome relief to the often information-overloaded listener. Sometimes the repetition of a central word or idea is better than a lot of excess chatter. Meow...meow"
ABOUT THE AUTHOR: Karen Farrell has a Master's degree in Social Work. She is a long-time observer of cats and enjoys their on-going power to astonish. Ms. Farrell lives in New York City. On a personal note: I have had the pleasure of getting to know Karen through email and find her to be astonishingly brilliant, delightful, humorous and every bit as insightful as her wonderful book. We both feel that "in life there are no coincidences", however, she and I have uncovered some "coincidences" in our lives that stunned us both, and that I believe have made us both feel we were destined to meet and become fast-friends. I was not compensated for this review. I was sent a complimentary copy of Cat Sense to read/review. And that is why, I do believe, that the world should be ruled by cats. Everything makes sense, from the feline point of view. purrr....meow! @Cat from Sydney, I couldn't agree more! This book is very interesting Caren, thanks for this great review! This sounds like a lovely book. We have so much to learn from our cats. Super review....and I totally agree that cats have a LOT to teach us about living life. I've long admired their ability to overlook the shortcomings of humans and live their lives with grace. This book sounds like it reflects much of what those of us who adore cats have observed in our years of admiring the art of "felinicity" ! You sure do find the best books! Have a great weekend sweet friends! @Pam and Sam your comment summed it up perfectly and I am so happy you enjoyed the review! @Ingrid I am certain that you would love it! @Luna and Leia THANK YOU! I am certain that you would love it as well and I am thrilled that you enjoyed the review! That sounds a very interesting book and as Hannah and Lucy keep telling me I must look and learn from them! That really does sound like a great book. We will start saving up our green papers. Have a great Friday. It sounds an interesting book and philosophy for life. Those of us who share our lives with cats are perhaps a bit more like them than those who don't. This book and Karen sounds like our cup of tea and she lives in NYC? Bonus. what a gem of a book! It seems to make so much sense. Be a rebel with a cause! That was my Mommy's Motto! We must read this book. @Layla yep! You must meet her, she is incredible. Then you can give each other hugs, from me! @Jewel so true. I am extremely cat like and I think most of us are. We totally "get it!" @Repositorio you are welcome and thank you for reading! @Marg you have a great Friday too and a great weekend! This looks like a great book. Thanks for sharing. I once had a cat whose favorite place to sleep was in the bathroom sink. What's up with that. The book sounds wonderful. Be a rebel with your own cause... I love his advice, too. I gotta learn the feline-style!! thank you guys for your wonderful comments! Pressed for time right now or I would answer individually but rest assured I read each and every one! Love you! What a neat book-and we enjoyed reading your enticing review! This Books sound nice and lovely. Me and mom love the the same advice as you ! Be a rebel with your own cause- "Unabashedly looking out for its own aims is the cause of the cat. A cat knows what it wants and is adroit at getting it. "